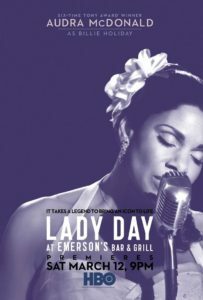 Lady Day at Emerson’s Bar and Grill opened on Broadway at Circle in the Square on April 13, 2014. 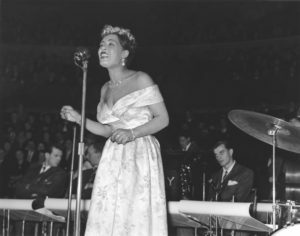 Lady Day at Emerson’s Bar and Grill, a play with music by Lanie Robertson, takes place in South Philadelphia in March 1959. Billie Holiday is performing in a run-down bar, during one of her last performances four months before her death in July 1959. She sings, accompanied by Jimmy Powers on the piano, and also tells stories about her life. Directed by Lonny Price, the production starred Audra McDonald as Billie Holiday and featured Shelton Becton as pianist Jimmy Powers. The sets are by James Noone, costumes by Esosa, lighting by Robert Wierzel and sound by Steve Canyon Kennedy. The play was originally scheduled for a limited 10-week engagement, but was extended several times until it finally closed on October 5, 2014. Audra McDonald won her record-breaking sixth Tony Award for the production, and she became the only person to win in all four acting categories, this time winning for Best Actress in a Play. The play also won for Best Sound Design of a Play. The 2014 Broadway production was filmed at the Cafe Brasil in New Orleans and broadcast on HBO on March 12, 2016. Audra McDonald received a 2016 Emmy Award nomination for Outstanding Lead Actress in a Limited Series or Movie for her role in the broadcast. McDonald was expected to reprise her role in the West End at the Wyndham’s Theatre, from June 15 through September 3, 2016. She was to take a 3-month break from her role on Broadway in Shuffle Along, or, the Making of the Musical Sensation of 1921 and All That Followed. However, in a change announced on May 10, 2016, Lady Day was postponed because McDonald and her husband Will Swenson are expecting a baby. She said, in part: “Of course, I’m disappointed I have to postpone my West End debut in Lady Day, but I look forward to rescheduling as soon as possible.” The play has been rescheduled, with McDonald making her West End debut. The play will be presented at the Wyndham’s Theatre from June 17, 2017 through September 9, 2017. McDonald took home her most recent Tony Award for her performance as Billie Holiday in Lanie Robertson’s Lady Day At Emerson’s Bar & Grill, a play with music set four months before Holiday’s death detailing a loopy, nostalgic evening at an imaginary Philadelphia jazz club. On the Broadway theatre scene since 1992, Audra Mcdonald is a living legend, so who better to choose to play this legendary Jazz performer? She’s won Tonys, Grammys, an Emmy and in 2015 she received the National Medal of Arts, awarded by then President Barrack Obama, the highest honour for Arts in America. When she played Lady Day last time it was said to be one of “the most reverting, hypnotic and flawless performances,” which is probably why she won her 6th Tony Award for it. For your enjoyment, here is a magical musical moment of Audra McDonald singing “Easy Living,” written by Leo Robin and Ralph Rainger, while recounting an experience in her life. 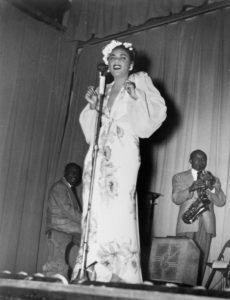 Born Elenore Fayan in 1915 in the jazz talent-rich Baltimore Lady Day began her career singing songs by Bessie Smith and Louis Armstrong from a very young age. When her Mother moved to Harlem-New York, Elenore soon followed where she would adopt her stage name Billie Holiday borrowing it from Hollywood film star Billie Dove. Although never receiving any technical training nor able to read music, at the age of just 18 Holiday was noticed by producers and recorded her first record. In 1935 she got her big break, recording four sides that went on to be hits including; “What a Little Moonlight Can Do” and “Miss Brown to You,” written by the famous songwriting team of Leo Robin and Ralph Rainger, starting her on a journey, and establishing her as one of the important building blocks of American jazz music. Billie Holliday tragically passed away at the young age of 44, but her emotive voice and innovative vocal techniques live on even in today’s music, cementing herself as a music legend. The play originally premiered in 1986 at the Alliance Theatre in Atlanta, Georgia, and soon played off Broadway. 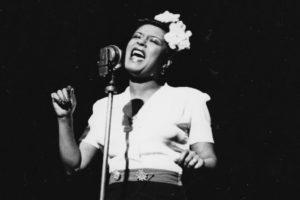 Lady Day at Emerson’s Bar and Grill premiered at the Alliance Theatre, Atlanta, Georgia, on April 16, 1986, with direction by Woodie King, Jr. and Reenie Upchurch as Billie Holiday. The play was next produced off Broadway at the Vineyard Theatre on June 5, 1986, and then opened in a Vineyard Theatre production at the Westside Theatre on September 7, 1986. This production closed on May 17, 1987 after 281 performances. Directed by Andre Ernotte, Lonette McKee starred as Holiday. In February 1987 S. Epatha Merkerson took over the role of Billie Holiday. The play won the 1987 Outer Critics Circle Award for Best Off-Broadway Book by Robertson. 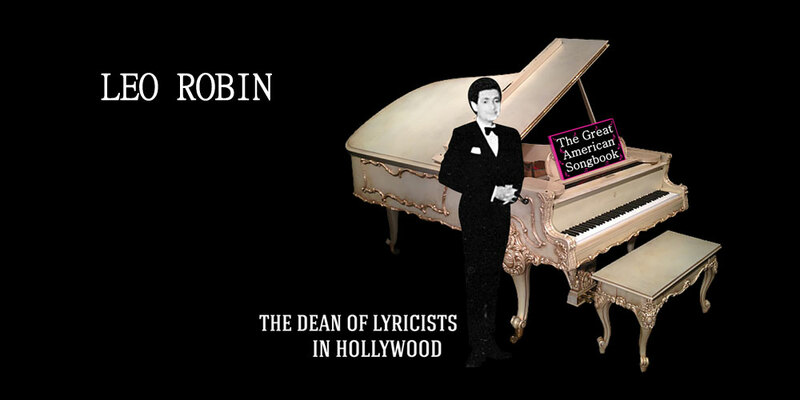 The Hollywood Playhouse, in California, produced Lady Day in October 1987, directed by Andre Ernotte, and with S. Epatha Merkerson reprising her role as Holiday. Ernotte said that he wanted to “deglamorize Billie: show the dark, sad side. So it’s not so much a nightclub act as a theater play with music.” He also noted that Merkerson brought another aspect to the role as an actress rather than as a singer. 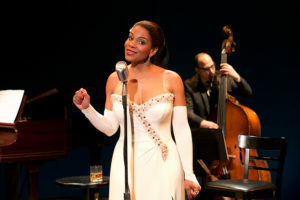 The play was presented at the Long Wharf Theatre, New Haven, Connecticut in November 2005, with Ernestine Jackson as Billie Holiday. The legend herself, Miss Billie Holiday has once again taken the stage, in the form of the insanely talented Diedrie Henry at the Actors Theater of Louisville for most of the past January of 2017.